Why choose us to organize Your 2015/2016 Private Tour? Because we’re real good at it. Because we have over 20 years of proven expertise in private guided tours and very solid credentials. Because we offer the best value for money, guaranteed. Because you are in for a superior, unforgettable trip. All our tours are fully customizable either based on our set itineraries or entirely tailor made to match your budget, particular interests and the number of days allowed for the trip. We are Members of the National Geographic Society and of the American Society of Travel Agents. We have consulted for both Frommer’s and Fodor’s. You probably have watched us on the Travel Channel. Now it’s time to travel with us ! Contact us for our 2013/2014 Tour Prices and Discounts as well as for any question you may have. We look forward to welcoming you in Romania ! 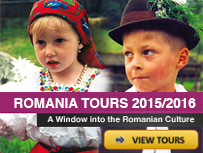 After checking over a dozen tour operators we have decided for the Romanian Rhapsody Tour. We found this to be the most complete itinerary and the best value for money. We are retired travel agents and did appreciate your hard work and patience in customizing our tour. The fact that we could enjoy the company of Andrei – your tour guide, meant a lot for us. He did a wonderful job. Couple of months later we saw him on the Travel Channel talking about Romania. Thank you very much. Mihai, we would like to give you our feedback in regards to our recent Rhapsody Tour of Romania. While we never really knew what to expect, the trip exceeded all our expectations. The fact that you guys personally check on all hotels you use makes a difference. We thought all our accommodations were really charming even though there are no elevators in Sighisoara. We appreciated you getting our rooms at the first floor. The highlight was our Maramures days. Send our regards to Ion, he is a great host and a great artist. Please thank his wife for her cooking. We also fell in love with Bucovina, the scenery there is heavenly and the service and rooms in the brand new hotel we stayed those two nights were really very good. Our guide, Mirel, was excellent. His English is clear. He is fun and flexible and drives very carefully. In the summer of 2009 we took an independent 11 day “Romanian Rhapsody Tour”. We particularly enjoyed the well balanced itinerary and the amount of free time in almost all the locations. It was great living with the locals in the area of Maramures. Another highlight was the interactive egg painting demonstration in Bukovina. Our tour guide was educated and charming and an excellent driver. Romania is a beautiful country with fantastic scenery and hospitable people. Thank you.